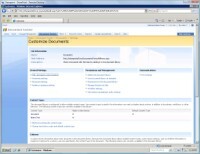 Are users customizing default SharePoint document libraries? 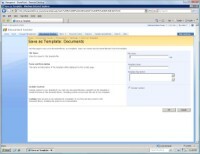 Learn how to use templates to control content customization in Microsoft SharePoint Server 2007. If you work in Microsoft Office SharePoint Server 2007, you know there is a seemingly endless array of customizations that you can make to SharePoint document libraries. Often, document library customization isn't so much a matter of preference as it is about adhering to company policy. The problem is that Microsoft designed SharePoint so that users could create their own SharePoint sites, each of which could contain one or more of its own document libraries. If a company has strict policies about how document libraries can be configured, you certainly don't want users to be able to create default document libraries. This is where templates come in. Templates allow you to model new document libraries off of a document library that you have already customized to fit your needs. To create a template, open your SharePoint site and click the Document Center link. When the Document Center opens, click the link that is tied to the document library on which the template is based. SharePoint will then open the document library. Click the Settings button and choose the Document Library Settings option from the menu. 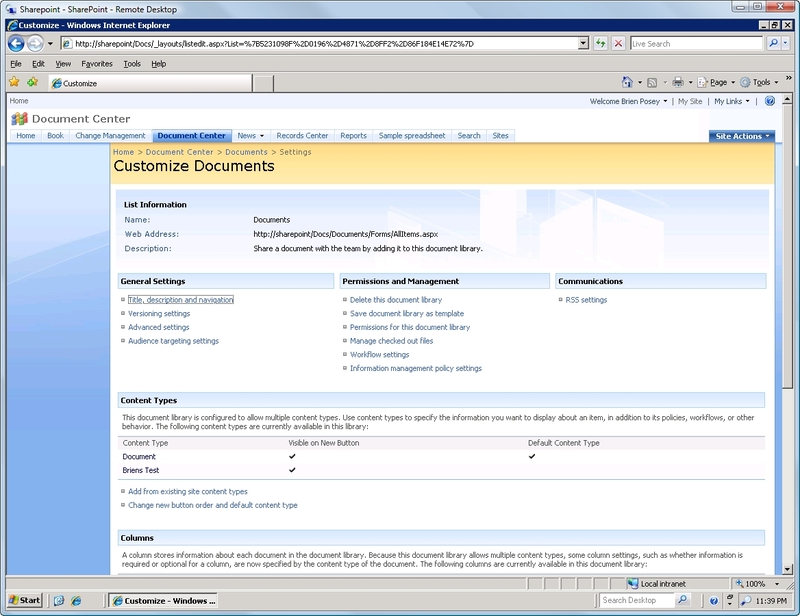 This brings you to the Customize Documents page, shown in Figure A. Finally, click Save Document Library as Template located in the Permissions and Management section. Figure A: Click the Save Document Library as Template link. Most of the settings found on the Save as Template screen are self-explanatory. You are required to provide a filename for the new template, a display name and an optional description. However, the Include Content setting often creates confusion. Figure B: The Save as Template page allows you to create a document library template. Select the Include Content check box and the template will contain not only your document library customizations, but also all of the documents that currently reside within the document library. This isn't always a bad thing. For example, you could create a customized document library, and then upload an acceptable use policy document. You could then turn the document library into a template and use the Include Content section, which would cause the acceptable use policy document to be included in any new document libraries that are created from the template. On the other hand, if the document library you are basing the template on contains actual data, then you won't want to use the Include Data check box. Keep in mind that SharePoint will not stop you from including content from a heavily populated document library in a template unless the document library contains more than 10 MB of data. But it will block you from including content in a template if the document library contains private content; in that case, the option to include the content is not available. If you do decide to include content in the template, then item security will not be preserved within the template and in the document libraries that are based on the template. Creating a document library based on the template is simple to do. On the main SharePoint page, click the Document Center link. Next, click the Site Actions button, followed by the Create option. Your template will appear at the bottom of the Libraries list. Two things about the template: One, you may not recognize it as a template at first because it uses the same name as the document library that it's based on. And, two, there is nothing forcing anyone to use the template when creating new document libraries. You will have to set some permissions if you want to force the use of the template. If you ever need to modify the template or download it for use on another SharePoint Server, you can access it by opening your main SharePoint page and clicking the Site Actions button. From there, choose the Site Settings and the Modify All Site Settings options. Finally, click the List Templates link, located in the Galleries section of the Site Settings page. Bottom line: Even if company policy does not allow users to create document libraries, templates can serve as a handy administrative tool that can save time and effort when someone has to create them in the future. Brien M. Posey, MCSE, has received Microsoft's Most Valuable Professional Award four times for his work with Windows Server, IIS and Exchange Server. He has served as CIO for a nationwide chain of hospitals and healthcare facilities and was once a network administrator for Fort Knox. You can visit his website at www.brienposey.com.